The Stranger has put his hang-ups behind him. You can't be resurrected unless you've first died. You can't understand pain unless you've first experienced it. This is the card of sacrifice that leads to a wiser life. 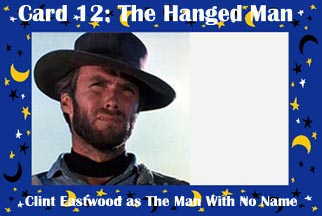 The stranger with the suspicious neck was hanging around at the Complete Clint Eastwood Homepage.